SINGAPORE: Cheng Wei, Co-founder and Chief Executive of China’s largest ride-sharing service provider Didi Chuxing (Didi), is Forbes Asia’s Businessman of the Year for 2016. 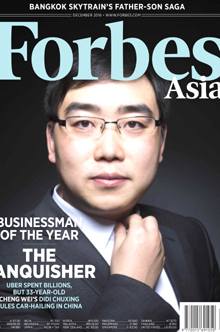 Cheng is featured on the cover of the December issue of Forbes Asia, available on newsstands now. The full story can also be found here. multibillion-dollar battle – during which Didi once shelled out 40 million yuan (US$5.8 million) of subsidies in a day - Uber agreed to sell its business in China to Cheng and quit the country. Born in a small town in landlocked Jiangxi province, Cheng didn’t excel at China’s all-important college entrance examinations. He turned over the pages too quickly and missed the last three mathematics tests. In the end, he got into Beijing University of Chemical Technology, considered second-tier to the prestigious Peking and Tsinghua Universities, to major in business administration. After graduation, Cheng went through half a dozen jobs, including manager at a foot-massage chain and a mobile phone component supplier. He even applied to be a tourist guide. A life-changing opportunity came in 2005. He grew determined to work in China’s burgeoning Internet sector and came knocking at Alibaba’s Shanghai office with his résumé in hand. It was there that he met his future cofounder Wang Gang, who for a time was his boss. From there, the seeds of entrepreneurship stirred; Cheng rose through the ranks at Alibaba before he and Wang set up their taxi-hailing business in 2012.
commands 85% of China’s ride-sharing market, which Beijing research firm Analysys International estimates will reach 122 billion yuan ($17.7 billion) by end of this year and 286 billion yuan in 2018.
invested a 18% stake in the company. Didi is currently valued at an estimated $35 billion. Cheng has plans to turn Didi into a serious global player in the future, rivalling Uber. “We will compete, but it won’t be as bad as what happened in China,” he said. Didi has already formed a series of alliances with Uber’s smaller rivals. In addition to a stake in Lyft in Uber’s core US market, it has invested in ride-sharing firms Ola in India and GrabTaxi in Southeast Asia. These investments also allow China’s 110 million overseas tourists to hail local cars through the Didi app when they are abroad. In early November, the company announced a partnership with global car rental firm Avis, also to serve China’s outbound travelers. “In choosing Cheng Wei as this year’s most notable business figure in Asia, we are taking a leap, as his Didi Chuxing is still closely held and far from profitable. At age 33, easily our youngest selectee, he should have plenty of time to bear out our wisdom,” said Tim Ferguson, Editor, Forbes Asia.